More than 750 million people in the world do not have enough food to lead a healthy, active lifestyle. In 2012, Covenant Day students felt compelled to respond to this staggering statistic. These students, along with the help and guidance of the faculty, created This Green Fish to respond to the growing hunger needs in the local community and abroad. This Green Fish ran for several years, before transitioning to the student led initiative, Restore 525, in 2017. Aquaponics is farming technology which combines hydroponics and aquaculture to create a sustainable system in which fish and plants grow simultaneously. The plants, which are grown in rocks, are watered by the pond or tank that the fish are in. 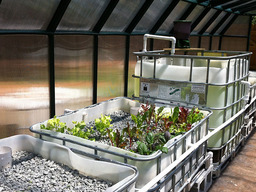 This serves to both clean the water and provide the plants with the nutrients they need to survive. How is CDS involved in Haiti? Covenant Day School has been sending teams of students and faculty to Haiti since 2007. With the addition of a fulltime class the teams will be getting considerably larger, and a full-scale system is being designed and implemented in Grand Guave Haiti. For more information about Restore 525, visit restore525.com, a website created by CDS students on the Restore 525 team. Click here to explore other restoration and sustainability initiatives at Covenant Day School. 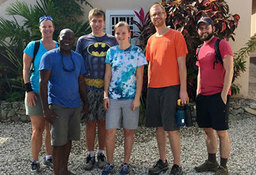 In the fall, a team of two teachers and two students traveled to Mission of Hope International (MOHI) based in Grand Goave, Haiti, to continue to develop the aquaponics system that was built several years ago. 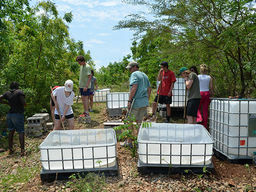 Covenant Day's aquaponics project was born after the 2010 earthquake when CDS teacher Clifford Chin and several teams from CDS went to Haiti to assist with relief work. Covenant Day students are working to improve living conditions for an orphanage in Haiti without even stepping outside of Matthews. Covenant Day School's plan to find sustainable food for the people in Jeremie, Haiti is finally starting to come into view.